Thought dead after a publishing deal fell apart with Sony, the surreal friendship simulator Wattam is coming to PC in 2018. Now being published by Annapurna Interactive and still developed by Funomena, it has you playing as the cube-shaped mayor of a land populated by talking pieces of meat, giant eyes, and smiling piles of poop. Need more friends? Make some with these great PC co-op games. Designed by Katamari Damacy creator Keita Takahashi, Wattam tasks you with making friends with the 100+ characters dotted around its whimsical world. Each friend has their own abilities and you can take control of any of your pals whenever you want, should you desire to play as a mouth with legs. You can stack your mates on top of each other, hold hands, or even dance together in one massive conga line. While everyone can become your friend, some characters will require some extra persuading. They might need you to solve a puzzle or gather a specific group of chums before they join the friend circle. Every time you make a friend, the Mayor will make a colourful explosion which attracts more characters to your world. I wouldn’t recommend exploding in front of your friends but it seems to be perfectly acceptable in the wild world of Wattam. Each character in Wattam also has their own theme music, meaning you can create all sorts of mashups by pairing certain characters together. Like most of Takahashi’s games, Wattam makes way more sense once you’ve played it and seen how all these seemingly random elements come together. 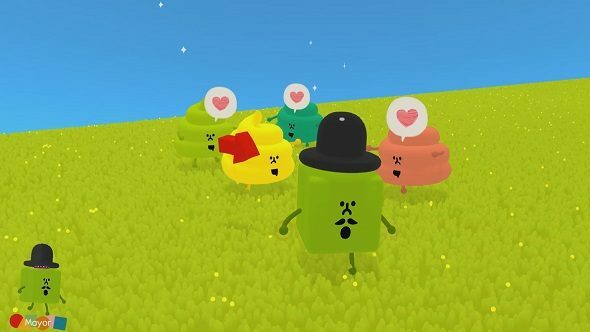 Wattam will be appearing at PAX West, so go visit the mayor and make friends with a talking broccoli stalk.